Cradle to Cradle Products Innovation Institute recently announced that they will begin offering standalone certifications for building materials based on its Material Health criteria. 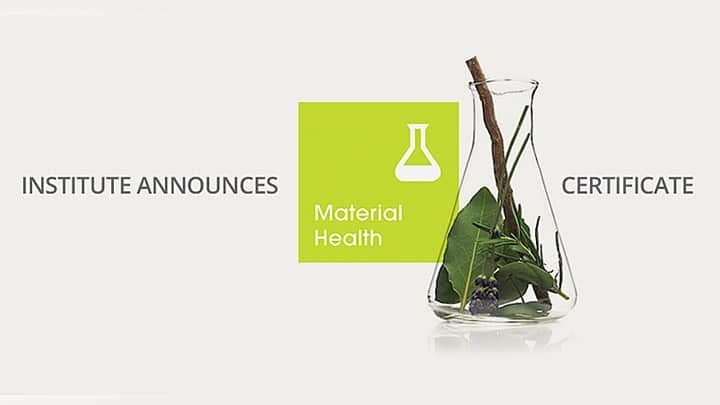 Material Health is only one of several categories tested during Cradle to Cradle certification, and it addresses the presence of known harmful chemicals in a material. It is the first time Cradle to Cradle has separated a category for certification. Established in 2006, the multi-attribute Cradle to Cradle Certified Product Standard has been recognized for its depth, rigor, third-party auditing, and ease of reporting via the certification label. Cradle to Cradle Certified products are assessed in five categories: Material Health, Material Reutilization, Renewable Energy, Water Stewardship, and Social Fairness. Now, companies have the option to pursue only the Material Health assessment. The requirements for Material Health certification are the same as in the standard C2C protocol. It starts by performing studies to identify the component chemicals present in a material and comparing them to several lists of known hazardous and carcinogenic chemicals. The material is then assessed for the potential hazards posed to manufacturing employees, installers, and building occupants. The standard requirements for Continuous Improvement and Optimization and Site Visit of the Production Facility must also be met. This means that with each re-certification (performed every two years), the material’s manufacturer must show improvement in the disclosing of chemicals used (reports must be more in-depth than previously submitted) and improving the health of the material, and it must host a visit by the certification body. Once approved by a third-party trained in C2C assessment, the product is certified for two years and will be listed on the C2C Material Health Certificate Registry. Industry groups, nonprofits, governments and companies of all sizes and industry are prioritizing the identification and elimination of chemicals of concern, driving manufacturers to know more about the chemicals in their products and supply chains; be more transparent about the chemicals in their products; avoid chemicals of high concern and shift to inherently safer chemicals; and commit to continuous improvement toward greener chemistry in their products. The Material Health Certificate offers an easy reference for specifiers and owners to understand where the product is on the path to being safe for humans and the environment. Like the LEED scale, Institute will offer an enhanced reporting format to the Material Health Certificate that will include the achievement levels of Bronze, Silver, Gold, or Platinum; an Avoiding Chemicals of Concern Summary based on the various levels; a summary of the assessment results, and additional elements, such as the number of unique materials assessed and percentage assessed by weight. Sources | Images: PR Newswire, Cradle to Cradle Products Innovation Institute.